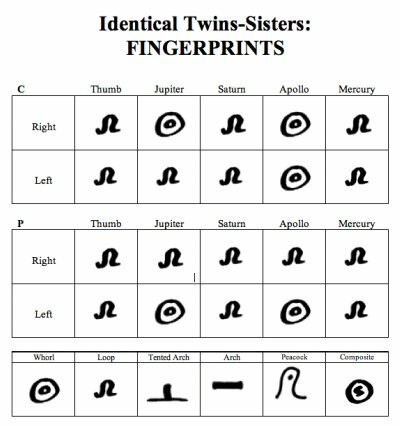 Does anyone have more information on fingerprint patterns in identical twins? 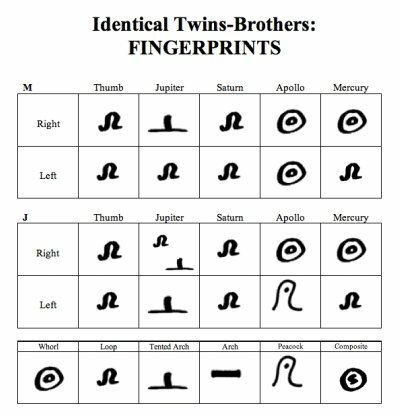 I recently had the opportunity to decipher the fingerprints of 2 sets of identical twins. The fingerprint patterns are depicted here. One of the twin sisters said to me, "you can't clone a soul, Janet". How true! Note the similarities and the mirroring, left hand/right hand of the patterns. Would love opinions on this. By the way, did you notice that the 'mirroring-effect' is only seen in the index finger (though regarding the twin brothers one could even argue that it might not be a mirror effect). But we should be aware here that such a 'mirroring-effect' can sometimes also be seen among family members (among brothers and/or sisters, and among parents and children). And I am pretty sure usually this phenomenon will manifest on the index finger (simply because that finger usually shows the most frequent variations). So, I am wondering... how common/uncommon is this phenomenon really among family members?? Actually, I have a small collection of 12 pairs of identical twins available... but I should add that all 12 pairs concern 'IDENTICAL 'MIRROR' TWINS' - this implicates that one twin-half is right handed, while the other twin-half is left handed... but they are for sure 'identical'. IF these 'mirroring-effects' are more common among identical twins (compared to other family members), I think it would make sense that these effects are even more common among IDENTICAL MIRROR TWINS. But as a first impression, I can report that not all twin pairs show a 'mirroring-effect', and I think it is even a minority - but I should check all details before I can specify this observation. Janet, I think we should collect some information on the occurence of these 'mirroring-effects' among other family members... before we can say anything about the significance of your observation on the occurence of this phenomenon among identical twins. If you have specified questions regarding my collection... just let me know! Hi, Janet. I have read also for two sets of identical twins and there wasn't a mirror effect for either set. I'm with Martijn, not enough of a sampling yet to really know. I have the fingerprints of my direct family - I have 5 siblings and both my parents are alive. And there is very little correlation in general between all 8 of us. Loops are the most common fingerprint but that is true for the general population. Almost all fingerprint types are represented: whorls, peacocks, loops, tented arches, arches - no composites. Sorry if you missed the essence of my observation. The mirroring in these two twins was just an interesting difference. My point was that I had always heard that identical twins have the same fingerprint patterns. I was doubtful about this. The point is even identical twins have varying patterns....thus the Soul Clone comment from one of the twins. Perhaps the left right/left handedness Martijn mentioned and the index finger switch shows up in "mirror twins". Hadn't heard this term before. hi Janet thanks for starting this interesting topic. The reason twins don't have the same fingerprint patterns is that, apart from the genetic aspects, the print development also depends on environmental conditions on the womb especially when volar pads are forming. You might think they are experiencing the same conditions in that shared environment, but twins don't develop equally the same, eg usually one baby is bigger than the other. (sorry that is a very simplistic description, I'm sure Martijn & Patti can elaborate on the foetal development aspect). HandTales wrote: Sorry if you missed the essence of my observation. The mirroring in these two twins was just an interesting difference. My point was that I had always heard that identical twins have the same fingerprint patterns. I was doubtful about this. The point is even identical twins have varying patterns....thus the Soul Clone comment from one of the twins. Hi Handtales, I saw a t.v. programme a while ago about twins and one episode was about mirror twins and they should you a twin looking in the mirror and the example they should was the twin looking in the mirror had a mole on her right cheek and was right handed, then when they brought out her twin, she had the mole on her left cheek and was left handed. Okay, thank you for explaining your point regarding the similarities in 'patterns' - obviously you were simply misinformed about that issue: for, dissimilarities in the fingerprint 'patterns' of identical twins are actually very common! PS. I think that even a very large majority of identical twins do not have 10 the same patterns - and we should also not forget that... even when there are 10 the same patterns, the each single individual fingerprint has it's unique characteristics, etc.